What every girl wants: sun.... sand.... and an oversized beach ball. 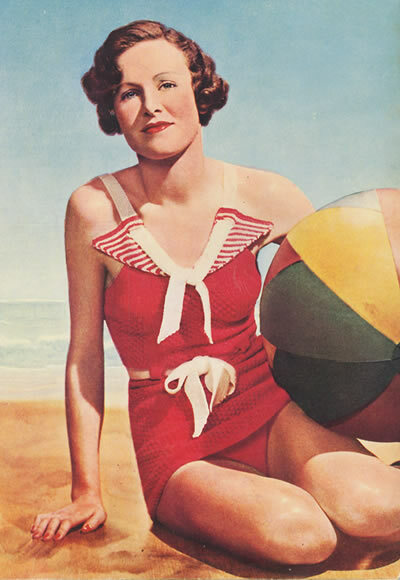 Continuing the red and white summer theme - the latest in swimwear for the 1930s. [O - and did I mention? - it's very practical and fits marvellously, (provided you have a 33-34 inch bust), and we can all breathe easily as it has a REGULATION skirt]. "You couldn't find a swim-suit with more snap about it than this one! 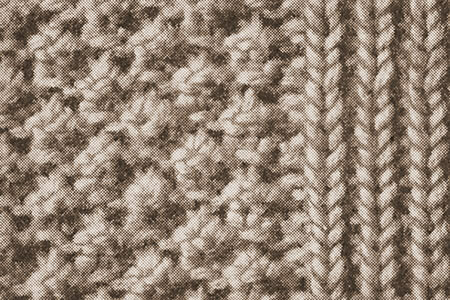 And it takes all the prizes on the practical side, too . . . . is simple to knit, fits marvellously and has the forethought to choose a stitch that doesn't stretch out of shape (bramble pattern, shown in detail on page 32, broken with bars of rib through which the belt is slotted). The suit is low at the back, and in front the shoulder straps slot through the amusing little striped revers to tie at the base of the neckline; it has, of course, the regulation skirt with brief, almost legless, trunks beneath." These instructions are given in one size only for a sun-suit with skirt and integrated knickers. Start with the front of the KNICKERS. With red wool, cast on 32 stitches. Work in stocking stitch, always knitting into backs of cast-on stitches. After the first row, cast on 3 stitches at the end of every row until there are 116 on the needle. Continue on these for 4 inches, ending with a knit row, then decrease 1 stitch at each end of every 4th row till 104 stitches remain. Continue on these until the side seam edge measures 9 inches, ending with a purl row. Leave these stitches on spare needle..
Now start at lower edge of SKIRT. 1st row (right side facing): (k1, p1) 3 times; p20, (k1, p1) 4 times; p36, (k1, p1) 4 times, p20, (k1, p1) 3 times. (p3tog, then k1, p1, k1 all into next stitch) 5 times, (k1, p1) 3 times. (k1, p1, k1 all into next stitch, p3tog) 5 times, (k1, p1) 3 times. These four rows form pattern. Repeat until work measures 13 inches from lower edge, ending with the 4th row of pattern. Now place needle containing the knicker stitches right side towards you, behind needle containing skirt stitches, and knit in pattern, as first row, knitting together 1 stitch from each needle. Complete this pattern, then work 4 more patterns. Keeping the continuity of pattern, shape for waist by decreasing 1 stitch at each end, in side ribbing, in every 4th row, until 2 stitches remain in rib at edges (4 stitches decreased each side). Next row: k1, p1, p20. Turn. Work in pattern on these 22 stitches for 8 rows, then leave on spare needle. Join in wool and work in k1, p1, rib on the next 8 stitches for 9 rows. Put these stitches on the spare needle, (next to the 22 sts from before). Work in pattern on the next 36 stitches for 9 rows. Put these stitches on the spare needle. Work in k1, p1, rib on the next 8 stitches for 9 rows. Put on the spare needle. Work in pattern on the remaining 22 stitches for 9 rows. Work the next row in the pattern, working all the stitches on to one needle again. Work in pattern on these for 3 inches, ending with 4th row of pattern. 1st row: (k1, p1) 5 times, p16, rib 8, p36, rib 8, p16, rib 10. 2nd row: rib 10, (p3tog, then k1, p1, k1 into next stitch) 4 times, rib 8, (p3tog, then k1, p1, k1 into next stitch) 9 times, rib 8, (p3tog, then k1, p1, k1 into next stitch) 4 times, rib 10. 3rd row: rib 14, p12, rib 8, p36, rib 8, p12, rib 14. 4th row: Rib 14, (k1, p1, k1 into next stitch, p3tog) 3 times, rib 8, (k1, p1, k1 into next stitch, p3tog) 9 times, rib 8, (k1, p1, k1 into next stitch, p3tog) 3 times, rib 14. 5th row: rib 18, p8, rib 8, p36, rib 8, p8, rib 18. 6th row: rib 18, (p3tog, then k1, p1, k1 into next stitch) twice, rib 8, (p3tog, then k1, p1, k1 into next stitch) 9 times, rib 8, (p3tog, then k1, p1, k1 into next stitch) twice, rib 18. 7th row: rib 22, p4, rib 8, p36, rib 8, p4, rib 22. 8th row: rib 22, k1, p1, k1 into next stitch, p3tog, rib 8, (k1, p1, k1 into next stitch, p3tog) 9 times, rib 8, k1, p1, k1 into next stitch, p3tog, rib 22. 9th row: rib 34, p36, rib 34. 10th row: rib 34, (p3tog, then k1, p1, k1 into next stitch) 9 times, rib 34. 11th row: rib 34, p36, rib 34. 12th row: rib 34, (k1, p1, k1 into next stitch, p3tog) 9 times, rib 34. 13th row: rib 38, p28, rib 38. 14th row: rib 38, (p3tog, then k1, p1, k1 into next stitch) 7 times, rib 38. 15th row: rib 42, p20, rib 42. 16th row: rib 42, (k1, p1, k1 into next stitch, p3tog) 5 times, rib 42. 17th row: rib 46, p12, rib 46. 18th row: rib 46, (p3tog, then k1, p1, k1 into next stitch) 3 times, rib 46. 19th row: rib 50, p4, rib 50. 20th row: rib 50, k1, p1, k1 into next stitch, p3tog, rib 50. Now continue to work all across in rib, decreasing 1 stitch at each end of every row until 92 stitches remain. Next row: k2tog, rib 44. Turn, and work on these stitches, leaving remaining 46 stitches on a spare needle. Next row: k2tog, rib to last 2 stitches, k2tog. Next row: k2tog, rib to end. Repeat last 2 rows until 10 stitches remain. Rejoin in wool at centre and work the other side to match. then work 4 inches in pattern. Work right across in rib for 4 rows. Now begin to shape low back. Next row: rib 20, cast off 64 (tightly) rib 20. Next row: Rib to last 2 stitches, k2tog. Repeat last 2 rows until all stitches are cast off. Join in wool at centre and work other side to match. These are worked in stripes of 2rows red, 2 rows white. Do not break off wool between stripes. With red wool, cast on 26 stitches. 1st and 2nd rows: Knit (in red). 3rd row: Join in white wool, knit. 4th row: k2tog, knit to end. 5th row: pick up red, knit to end. 6th row: k2tog, knit to end. 7th row: pick up white, k2, cast off 8, knit to end. 8th row: k2tog, k12, cast on 8, k. 2. 9th row: pick up red, knit to end. 10th row: k2tog, knit to end. 11th row: pick up white, knit to end. 12th row: k2tog, knit to end. Repeat last 4 rows until 2 stitches remain. With red wool cast on 26 stitches. 4th row: knit to last 2 sts, k2tog. 6th row: knit to last 2 sts, k2tog. 7th row: pick up white, knit to last 10 sts, cast off 8, k2. 8th row: k2, cast on 8, knit to last 2 sts, k2tog. 10th row: knit to last 2 sts, k2tog. 12th row: knit to last 2 sts, k2tog. With white wool cast on 2 stitches. Work in k1, p1, rib, casting on 2 stitches at the end of every alternate row until there are 14 stitches on the needle. Work in rib on these stitches for 45 inches. Shape end by casting off 2 stitches at beginning of every alternate row. With white wool cast on 2 stitches. Work in k1, p1, rib, casting on 2 stitches at the end of every alternate row until there are 12 stitches on the needle. Continue on these stitches for 24 inches. Make second piece to match. Press all pieces well with damp cloth and hot iron. Sew up side seams and knicker seams. Work a row of double crochet round leg openings. Place lower edge of slot in front trimming to top of the 10 cast off stitches at top of front. Sew along lower edge of this slot, then sew straight edge of trimming along edge of the V of front opening. Shaped edge of trimming is not fastened down. Sew unshaped end of shoulder straps to back, draw through slot at front to required length, then stitch to the top of the slot and knot at bottom of V opening. Draw belt through slots at waist and tie in bow, at back or front, as preferred. 13 ozs of "Diana" non-shrink 4ply [pictured costume uses 11ozs of Cavalcade red and 2 ozs white]. [Editor's note: When substituting with modern fibres you may need more than the quantities stated. One pair No 11 (3mm) needles. To fit 32-33 inch chest. p3tog: purl 3 sts together (decrease 2 stitches). (k1, p1, k1 all into next stitch): increases 2 stitches. Internet search states a yardage of 209 but no ball weight given. 209 yards for a 1 oz ball would be quite high. If you make this with a substitute yarn, perhaps a cotton would be nicest though cotton does tend to stretch, despite the reassurance that bramble stitch "doesn't stretch out of shape". Close-up of bramble stitch and rib.